China, the late 1950s, in the middle of Mao’s ‘Great Leap Forward’. Stretching across land located near the Yellow River is a collection of reeducation camps, prisons in all but name, where those with unrevolutionary thoughts are sent to be reformed. In one of these Chinese gulags, the 99th, a group of intellectuals known only by their occupations (the Author, the Scholar, the Musician, the Technician) are set to work by their supervisor, an enigmatic figure called the Child, forced to grow wheat to feed the country’s enormous population. When he gazed into the distance, he saw Kaifeng stretched out before him, with houses scattered about, just as the Theologian had described the Tower of Babel. There were no trees in the entire city, as all of them had been chopped down for use in the steel-smelting furnaces. The landscape was completely bare, and Kaifeng looked like a wasteland. This environmental destruction starts off innocently enough, but as the novel progresses, the damage becomes ever worse, starting a chain reaction of events officials are powerless to stop. 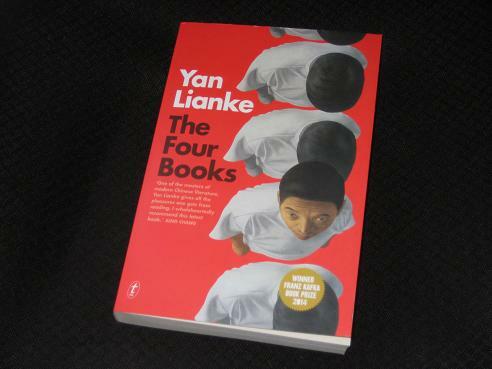 One of the focuses of Yan’s novel is an examination of the system which allows these events to happen. In such a vast society, there needs to be a way to control the people, and it might seem hard for the western reader to understand how the Re-Education camp works at first. There appear to be no guards, merely the Child, with nothing stopping the inmates from simply walking off. The truth is, though, that the size of the land itself is part of the solution – there’s a Siberian element to the isolation, and for tens of miles around nothing but more camps. Anyone wandering off will merely be picked up somewhere else. But by whom? Well, that’s the clever part. The missing guards are supplied by the prisoners themselves, who are actively looking for people breaking the rules in the hope of being rewarded, and (if they’re lucky) even being sent home. The early chapters are full of people prowling around in the dead of night in the hope of catching a couple of their fellow prisoners in flagrante. The irony here is that the Child himself is caught in the same trap. Each time he proudly reports the achievements of his camp, his superiors dangle another carrot in front of him, promising trips to the capital if he can just squeeze more wheat and steel from his prisoners. While the prisoners see him surrounded by a kind of aura, outside his little world, it’s clear that he’s merely a low-ranking functionary, just as trapped as those he watches over. Anyone interested in reading The Four Books will no doubt be intrigued by the title – and, yes, there are four books, extracts of which are interspersed throughout the novel. The first one to appear, Heaven’s Child, is written in a manner mixing Biblical language and fairytale style, an anonymous chronicle of the events of the camp. Two of the other books are written by one of the prisoners, the Author: Criminal Records is an account he is commanded to write (in secret) by the Child, recording events in the camp; Old Course is his own take on daily life, a more critical look at the disasters befalling the prisoners. Each of the books has a distinct style, with its own, slightly unreliable, author. Definitely. I wasn’t a huge fan of his 2012 IFFP-longlisted work Dream of Ding Village, but this is much better. It’s a clever, satirical, thought-provoking look at a controversial period in China’s modern history, made all the better by the knowledge that the writer has had to carefully measure every word. While not explicitly criticising the party, and perhaps emphasising the way the best intentions can be ruined by vested interests, Yan paints a sobering (and, at times, bloody) picture of a people in crisis. For me it’s 9th out of the 11 I have read so far and well short of my shortlist. But I read this before the MBI longlist was announced and I think that skews my views: it is I think more prizeworthy, for example having rather more substance than many on the list, than it is a particularly good book on a standalone basis, it doesn’t quite live up to its ambitions. The four books concept, in particular, didnt work as well for me. Yes there are stylistic differences but they are all discernably by the same author, and I thought Han Kang managed her shifts of register better. Also in reality 90 per cent is from two of the four books and the difference between those narrows as the tale becomes increasingly fantastical. The author also failed to make me believe at all that these were all extracts from much longer books: simply starting each excerpt with “page x” didn’t convince me that he had any concept of what was in the unextracted parts of each. But I think your view is not only more generous but also more accurate than mine, and I think it will be on the shortlist, albeit I can’t see it winning, not even Best Book from North East Asia! I’m not sure I saw the paper blossom reward system as ingenious as much as I saw it scoffing at the way the prison camps were run. And to me, it simply led to the prisoners “tattling” on each other, much like children in an elementary school. No, there was no need for prison guards with the people turning on each other such as they did. If the mark of a prize winning novel is how clearly the picture of the story is portrayed, and how deeply it stays in one’s memory, this is indeed worthy of the short list. Like you, I thought this was a great leap forward (couldn’t resist) from Dream of Ding Village.I thought the allegorical approach worked well in both understanding the historical events and allowing the novel to be read more widely as an archetype of coercive societies. My only comment is that that cover is infinitely better than the British publication’s.